The first session of the day was by David Row, who works for Libraries West, and focused on Geographic Information Systems (GIS). What is GIS I hear you say? GIS is a system, which captures and allows the user to manage, analyse and visualize geographic data. David wanted to discuss how libraries can use GIS data to improve our systems and reporting, where open access (OA) data can be sourced and the importance of making data available and reusable. David spoke about the location data that can be collected from issuing a book. For example, where it was issued, where the person who borrowed it lives, where the book is stored/located, where the book was written and locations in the book, and where it was published. All of this information can be used to create a multitude of maps. 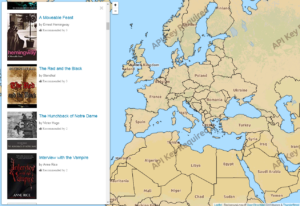 For example, Mappit and Literary Atlas of Wales were two ways to map locations in books. As David works in public libraries they were interested in library locations and the relationships between percentage of population, distance, demographics and who uses the library. This data was being used to determine resources and funding, but he discussed the possibility of using it to identify groups who weren’t using the library. Project to display English libraries data in a data dashboard. The data from openstreetmap.org was also used to plan routes for users to find the best way to get there [Wales Libraries Postcode Assessment]. He also used Wiki data to plot 5 mile radius, taking into account routes to plot real accessibility rather than just distance as a straight line between two points, and LIDAR* to create 3D maps of libraries in Wales and a visualisation of Somerset mobile libraries timetables. *LIDAR: is a surveying method that measures distance to a target by illuminating the target with pulsed laser light and measuring the reflected pulses with a sensor. Below you can find a list of projects and some useful links to follow up on any of the projects mentioned or follow the progress of the work. Visualising UK public libraries on Twitter. Showing latest tweets, latest accounts and tweet/follower counts. 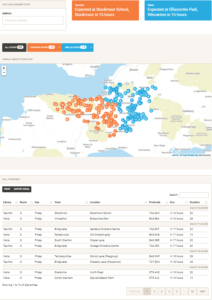 A project to visualise Somerset mobile libraries timetables. Uses a live departure board to display arrivals/departures. 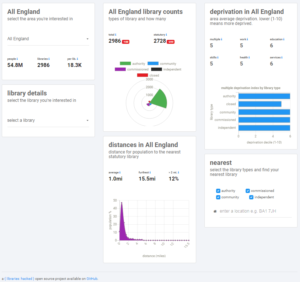 A project to display a dashboard of data about all libraries in England. Including type, locations, deprivation stats, and catchment areas. A public libraries news data dashboard, with links to a WordPress plugin and shareable widget code for embedding PLN news data on any website. Browse Early English Books open data, as released by the Bodleian library. Compiling many libraries datasets, storing these on GitHub and visualising into a basic data portal. A project to search all UK public library catalogues in the UK at once. For personal use in finding books, and for data analysis. The second session was by James Clay (Jisc) whose discussion was around the Smart Campus/Intelligent Library. The idea behind the Smart Campus is about working towards ways to dramatically improve the student experience by gathering and analysing data from across a university. Jisc are looking at effective ways to use data gathered from the physical environment and combine it with learning and student data from library systems, the virtual learning environment (VLE) and even on-site cafes and bars to deliver the best student experience. 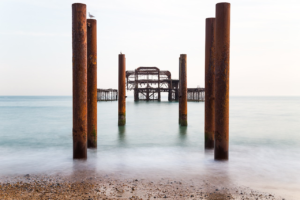 Jisc are developing the learning data hub, which essentially acts as an intermediary between existing and future systems, so it is easier for institutions to combine data from across the university and analyse it to optimise user experience. Bottom row shows where data is being collected, middle row is where the analysis occurs and top row shows where it is used. Some of the other ideas James discussed were wayfinding and he suggested looking at how airports have tried to make wayfinding as intuitive as possible. For example, if a person knows where they need to be and how to get there it gives them more control over their journey e.g. you can look at information needs and movements throughout an area to determine the position of signs or reduce congestion and improve use of space. The Intelligent Campus would improve student experience and improve campus use. The questions: What am I learning? How do I get there? What do I need on my reading list? and What is available on the library catalogue? could be answered without the need to visit 4 different sites. Turning off heat, light and computers when no students are using a space could be used to save energy and improve green credentials. Where are our students? Could we track them to improve Wi-Fi access or make suggestions of where to go when study rooms are busy or suggest the best times to go print, study, access a computer, etc. It was suggested that the data we have on a student’s learning, attendance and progress combined with current finances could help universities to anticipate difficulties or anxieties and respond to them instantly. The session also briefly covered some problems and issues around this area. He briefly discussed the technical issues such as what can be counted as a single individual as a sensor may pick them up and have a phone, laptop and tablet. Issues around analysis: for example, drawing false conclusions about cause and effect. He also briefly discussed the ethical issues with collection and tracking individuals and the need for clear processes and policies, respecting individual privacy and ensuring students are aware and in control of their data and its usage. Would you like to know more? Details below. The final session was by John Lubbock from the London chapter of Wikimedia. John is responsible for promoting the Wikimedia UK and increasing engagement with both institutions and the public. The core of his work is to encourage everyone to become a Wikipedian. The concept of a Wikipedian is intended to be open and inclusive, so you are a Wikipedian even if you only add a citation, edit or correct a page. The key idea is to work as part of a larger community. His presentation focused on the different ways in which libraries can get involved with Wikimedia. He wanted to draw out the idea that libraries and Wikipedia both work to provide free access to information and can support one another. Wikimedia wants to encourage and work with the information sector to improve the quality of the information across Wikimedia, in particular meta-data and citations. He discussed a number of campaigns that libraries can get involved with and sessions that libraries can run for their users. There is an annual campaign to encourage librarians to add references to improve the quality of content called #1Lib1Ref. By using the Citation Hunt Tool or going to a particular article, everyone can add one citation to improve the overall quality of a range of pages. He gave an overview of a number of other projects such as Wiki loves monuments, an annual international photographic competition, the issues with a lack of biographies for notable women, and the need to create pages for minority languages. He also wanted to champion open access. On the Wikimedia Foundation front page it says ‘Imagine a world in which every single human being can freely share in the sum of all knowledge. That’s our commitment.’ Open access is a key part of the work and Wikimedia are working on a number of projects, such as Wikimedia Commons, an online repository of open access media files, which everyone can use, share, distribute and transform, even commercially. The approved licenses for Wikimedia content are CC0, CC-BY and CC-BY-SA; the emphasis on ShareAlike ensures that once something is in the public domain it remains there. John suggested that if you’re interested in becoming a Wikipedian then you should look at criteria for the creation of pages; go to the Wikipedia pages on notability and identifying reliable sources, or if just want to find out more then look no further than below. WikiProject Open Access aims to help Wikipedians cooperate, organize, and share ideas on improving open access-related articles on Wikipedia, and provide OA materials with a new life, through Wikimedia projects.